Eight ships in the Gaza-bound flotilla were barred from leaving the Greek ports where they are anchored in the wake of an order issued on Friday by the Greek government. Flotilla participants and members of the leftist opposition in Greece have accused the Socialist government of caving in to Israeli pressure – a claim rejected by Greek Foreign Minister Stavros Lambrinidis. The Greek government is preventing the departure of the vessels in order to avoid a “humanitarian disaster” which will result from a violent confrontation with the Israeli navy, Lambrinidis told Veronique De Keyser, a Belgian member of the European Parliament. The information was received by a member of the Belgian delegation on the vessel Tahrir, in an email from De Keyser, who is also vice chairman of the Group of the Progressive Alliance of Socialists and Democrats. The foreign minister also promised De Keyser that he will continue to negotiate with the UN in order to find a solution to the flotilla crisis. The ban applies to all Greek and foreign vessels in Greek ports heading to Gaza. Meanwhile, some of the participants at the Socialist International in Athens, presided over by Greek Prime Minister George Papandreou, were critical of Papandreou’s instructions to block the flotilla, according to flotilla activists. Dr. Mustafa Barghouti, who heads the Palestinian national initiative movement which participated in the meeting, described the Greek government’s instructions as a shameful surrender. The organizers of the flotilla are considering legal action to cancel the Greek ban on the departure of the ships. They are also trying to rally members of leftist parties in various countries and the European Parliament to convince the Greek government to change the orders. Most of the approximately 300 activists are still in the ports where the ships are anchored, in the hope that they may be able to set sail for the Gaza Strip. Before the official publication of the instructions at 4:30 P.M. on Friday, the boat of the American delegation tried to set sail from the port of Perama without clearance from the Greek authorities. The ship was carrying 51 passengers, including five members of the crew and 11 journalists. According to the flotilla organizers, the delays by the Greek authorities in granting permission to sail stemmed from political pressure. The American ship, Audacity of Hope, named after the book written by President Barack Obama, was blocked by a vessel of the Greek coast guard. After the members of the American delegation were warned that their ship would be taken over by force they agreed to sail back to port, shadowed by the coast guard vessel. At about 8:30 P.M. they were guided to a navy port. The passengers were allowed to disembark but the crew was asked to stay on board. The captain, John Kusmir, was arrested. He is to be charged with defying a ban on Greek or foreign ships bound for Gaza from leaving Greek ports, and is to face a fast-track trial starting tomorrow, according to reports. Activist Vangelis Pissias said the U.S. vessel had just left the Perama port, near Athens, when it was stopped by the Greek coast guard. The journalists accompanying the American delegation during the past week left Greece on Friday. As of yesterday afternoon, many of the members of the American delegation were still on the ship. On Friday, the Hellenic Coast Guard headquarters ordered all local coast guard stations to employ the necessary measures to enforce the orders of the Minister for Citizen Protection, Christos Papoutsis, including the use of electronic identification to locate the vessels. A copy of the written order was delivered on Friday afternoon to the organizers of the flotilla on the Canadian vessel Tahrir. The orders apply to eight vessels in Greek ports: two cargo vessels (carrying almost 3,000 tons of aid, medicine, a fully equipped ambulance and cement to Gaza ), and those of the Spanish, Dutch-Italian, Canadian, French, American and Swedish-Greek-Norwegian delegations. In addition to the eight vessels in port, there is one French ship that has been at sea for a week. An Irish ship canceled its participation after a malfunction was discovered, which the activists say was due to sabotage. “The organizers didn’t do the minimum required in order to prove that there was indeed sabotage; they didn’t even file a complaint with the police,” Palmor was quoted as saying. 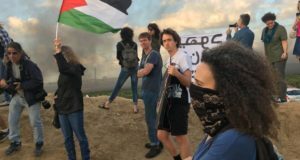 The activists have rejected Israeli claims that they are carrying dangerous materials or that they planned to use violence against Israeli soldiers trying to stop them at sea. The Turkish daily Hurriyet reported yesterday that an investigation by Turkish police into the alleged sabotaging of an Irish ship set to take part in the flotilla revealed that the damage to the ship occurred before it docked in Turkey and was most likely not caused intentionally. Flotilla organizers have claimed that the ship was docked in Turkey’s territorial waters when the alleged tampering occurred. Mihail Kritsotakis, a Greek parliamentarian who is part of a leftist coalition, and a resident of Crete, visited Tahrir at the marina of Agios Nicolaos yesterday. “The Greek government is obeying the orders of Israel and that is why the ship is anchored here. Were Greece a genuine democracy, the ship would have already set sail,” he claimed. Kritsotakis added that the pressure on the Greek government was clear by the thanks Prime Minister Benjamin Netanyahu expressed to Papandreou last week.